Beaded neck chains, ball chains, bead chains, plastic bead chains, metal bead chains, neck chains; all valid terms to describe the various chains we can provide your organization. Practical and attractive, our beaded neck chains are available in both metal and plastic... and are used for a wide variety of purposes. 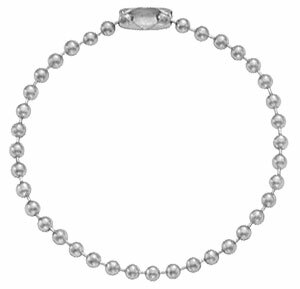 Metal bead chains come in several bead sizes and lengths. 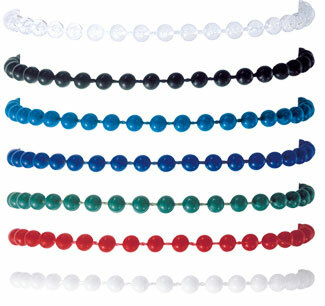 Plastic bead chains are available in a choice of seven colors. 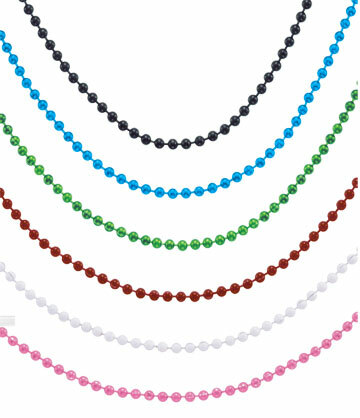 All of our chains, even the plastic bead chains have a metal connector for easy, secure attachment. Metal bead chains are available in 4", 4.5" and 5" lengths and are used for attaching keys, luggage tags, display signs, etc. Nickel or brass-plated finish; all have easy open and close metal connectors. Note: Chain attachments are available in several lengths, finishes and bead sizes - call for details. Reproduction in whole or in part is forbidden by law.